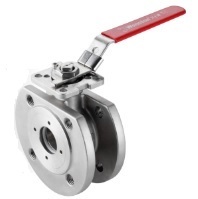 A stainless steel wafer ball valve DIN with mounting pad, PN16/ PN40. Design features: Anti-Static devices for ball-stem-body; blow-out proof stem; pressure balance hole in ball slot, ISO 5211 mounting pad for easy actuation; handle lever operated with locking device; full port(FB), RF flanged ends, DIN standard PN16/ PN40. Design standards: design code: DIN 3357, EN 12516-1; fire safe: API 607, ISO 10497; end flange: DIN EN 1092-1; inspection & testing: API 598, DIN 3230, EN 12266. The G.A drawing illustration of DIN standard stainless steel wafer ball valve, PN16/ PN40 with mounting pad. 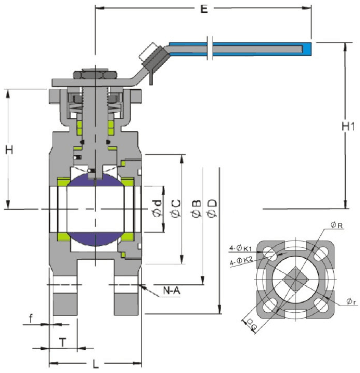 Dimensions of ss wafer ball valve with mounting pad, DIN standard, PN16/ PN40. All dimensions are in mm unit.